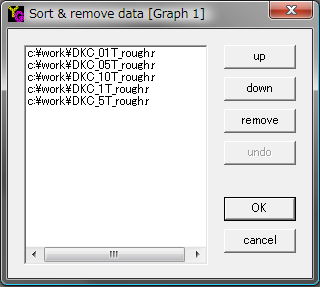 This item is used to change the sequence of the data files in the active graph. You can also remove data files that you don't need. This function is useful when you want to put a certain data at the top for better lookong of the graph. You can move up the selected data file in the left list-box by clicking this button. You can move down the selected data file in the left list-box by clicking this button. You can remove the selected data file in the left list-box by clicking this button. You can undo the previous action by clicking this button.